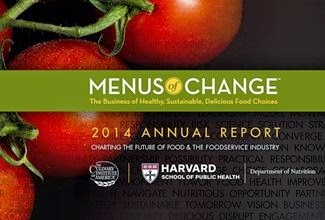 The Menus of Change -- a project of the Harvard School of Public Health and the Culinary Institute of America -- brings together industry folks, chefs, academics, and advocates to discuss private-sector and public-sector action regarding both nutrition and the environment. The new annual report summarizes recent trends, progress, and lack of progress, topic by topic. Restaurant News published a good summary of the project's lively and engaging second annual summit, which was held this week in Boston. The article noted that three leading themes from the summit were coping with climate change, finding better ways to source protein, and increasing fruit and vegetables on menus. The conference’s presenters tied the three topics together, presenting evidence that excessive consumption of red meat is a leading cause of heart disease and a contributor to diabetes, and that red meat — particularly beef — is a key contributor to global warming. They said foodservice operators should try to introduce other sources of protein and also replace much of that protein with vegetables and fruit, particularly since most Americans eat more protein than they need. Menus of Change is just one of several initiatives that seem to combine sustainability and nutrition issues in higher profile ways. I am on the Scientific and Technical Advisory Committee for this project. Other such efforts include the AGree agricultural policy initiative, some of the work last year of the Food Forum at the Institute of Medicine, and the current round of the Dietary Guidelines for Americans (for example, see the recent presentation by Kate Clancy). For a child, eating a piece of fruit is not some big challenge like climbing Mount Everest. It is realistic for us to expect school meals programs to meet the modest sensible new standards. All over the world, children are capable of eating the basic amounts of fruits and vegetables that are served under the new standards. Throughout longer-term U.S. history, I imagine children have eaten meals with these amounts. It is the recent history of fast food meals in school that are the aberration. In a transitional year, it is not surprising to see some reports of increased plate waste. Everybody recognizes that plate waste may go up for new menu items, and then come down again as children become accustomed to them. In this week's Congressional struggle over child nutrition programs, some folks describe the new rules in terms of a food police state run amok. This is not fair. In contrast with government restrictions on, say, advertising practices targeting adults, what we serve in schools has nothing to do with police power. Taxpayers and parents are entrusting schools with several billion dollars each year, in return for feeding our children. Surely the adults who receive these funds for this task can serve reasonably healthy meals. I had the chance to discuss these issues with Alan Bjerga at Bloomberg, whose article was published today. He quotes both critics and supporters of the new rules. I pointed out that the new standards themselves are probably not the problem. I strongly suspect that the school food service operations would be better sports about this change if only Congress had offered them more than a measly six additional cents per meal to compensate for the potential cost increases that might result. Other recent coverage comes from National Public Radio. The Robert Wood Johnson Foundation offers this infographic (which I saw on the Food Politics blog). 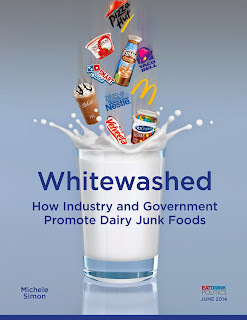 Food industry critic and reform advocate Michele Simon this week released a new report sharply critical of marketing practices for certain dairy foods including pizza and sugar sweetened dairy drinks. Most of this marketing effort originates with the federal government's fluid milk and dairy checkoff boards, which are semi-public government-endorsed programs that are funded through a tax or mandatory assessment on dairy producers. My view of this issue is not anti-dairy, nor do I favor government restrictions on private-sector advertising for dairy products. Yet, surely reasonable people can agree on this: any federal government-sponsored producer boards, and any marketing funded using the federal government's power of taxation, ought to be consistent with the Dietary Guidelines for Americans. The checkoff marketing should not be for Pizza Hut or for sugar-sweetened drinks. In these times of major health crisis and rising public sector health costs, we should expect the foods and beverages marketed in the government's own voice to be healthy. For readers following up on this story, here are some related links from a diversity of official and non-official sources. The U.S. Food Policy blog post on this topic in February. The annual report to Congress from USDA's Agricultural Marketing Service (AMS), describing the fluid milk and dairy checkoff programs. Although the report is annual, the most recent report online appears to be 2011. A report from USDA's Agricultural Research Service (ARS) earlier this year about pizza consumption in the United States. The dairy checkoff program's website describing its partnerships with Domino's, Pizza Hut, Taco Bell, and McDonald's, with an online video titled "McDonald's thanks America's dairy farmers." A 2010 article by Kim Severson in the New York Times about sugar-sweetened milk in school meal programs.